There will be anger in the workplace as long as there are people in the workplace...but it doesn't have to be a bad thing. When expressed in healthy ways, anger can fuel effective action, leading to higher levels of loyalty and productivity. Whether you're an employer, employee or both, you need to understand this problem. And you need to have solutions that work, long term. There are causes of workplace anger, and it's not just "bad people." It's too easy to place blame. Real change comes when everybody takes responsibility. Most people don't plan to get angry at work, so that tells us it's an unconscious process. You're going to learn some things right here that will help you understand this problem and what to do about it. How Does Anger In The Workplace Develop? Nobody wants to go to work and deal with angry people all day, but a lot of you are faced with exactly that situation. It's not planned, so that tells us it's unconscious. As a result, old unresolved issues emerge, such as family of origin dynamics, or past employment problems. As people try to resolve those old issues in the new workplace, destructive patterns start to take over. Inevitably, as a part of this process, anger starts to show up. Of course, there's also the occasional situation where someone joins the company, or gets promoted, who has a lot of anger issues. However, even then, these anger issues are subconsciously driven by past unresolved issues. Other things that can cause anger in the workplace are bad decisions by management, dictatorial bosses, sexual harassment, discrimination and favoritism. In each of these instances, however, the anger that shows up will only be an extreme problem if the angry individual has unresolved issues from the past. As the drama heats up, you will find again and again that a familiar pattern starts to develop. Somebody's the "bad guy," others are the "victims," and there will always be some sort of "rescuer" that shows up. Let the "games begin." This diagram will show you how the "game" works. Sometimes referred to as the Karpman Drama Triangle, this shows the process that leads to tremendous problems in homes, workplaces and even among nations. In this triangle, everybody is looking at someone else, and not taking personal responsibilityfor what's going on. The "blame game" is in full force, with everybody blaming somebody else. 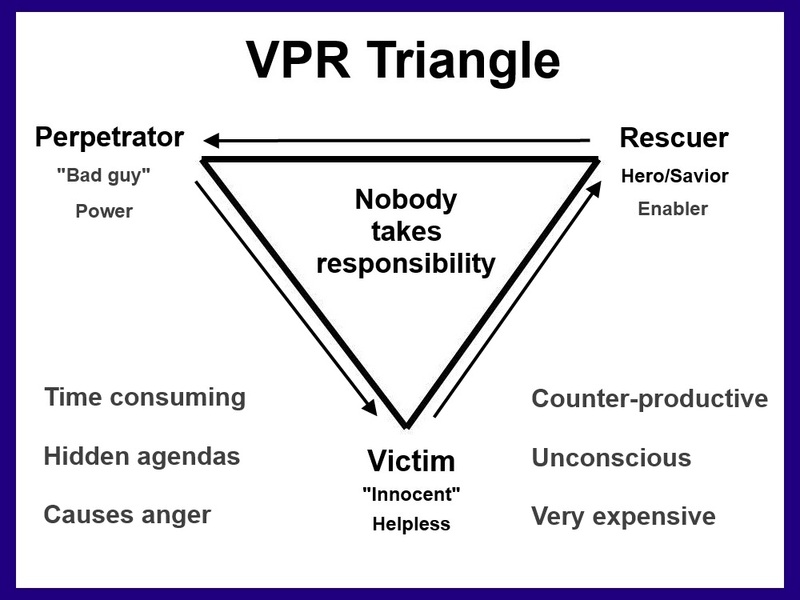 If the victim or rescuer gets angry enough, they might become the perpetrator...potentially, everyone can play all of the positions, and nobody gets what they want. At that point, the perpetrator can become a victim, and look for new rescuers to heat up the battle. 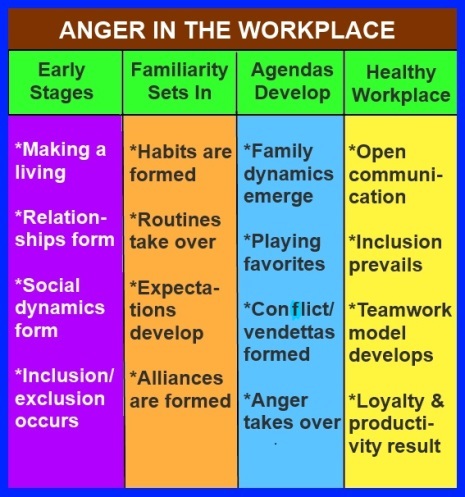 This gives you a good overview of how anger in the workplace can develop and grow over time. Now let's look at how a workplace can become healthy. How Does A Workplace Get Healthy? This is a big subject, and there are no easy answers or quick fixes. However, there is a powerful tool that I have used in some of my business consulting work, that works very well for transforming unhealthy emotions into healthy, productive action. This change process must be initiated and implemented at a leadership level. Some changes can be made at other levels, which you can learn about here. Emotional intelligence training programs are offered throughout the organization, and participation is strongly encouraged. These programs help participants to express their emotions, such as anger, fear and sorrow in a safe, healthy context that leads to culture change and greater productivity. Since most people when they're upset want mostly to be heard, the simple process of speaking your emotions and someone hearing and responding in a respectful manner can greatly improve the emotional environment. The final steps, once the emotions have been expressed and heard, is to implement positive changes to address some the issues that have surfaced. All of the games stop when you take responsibility for your emotions and your actions. That's what the Anger Management Techniques audio program is all about. Of course, this page is not enough to help you actually create and implement the programs you need to deal with anger in the workplace. It will, however, help you understand how this change could actually be made if you (including corporate leadership) choose to implement it. 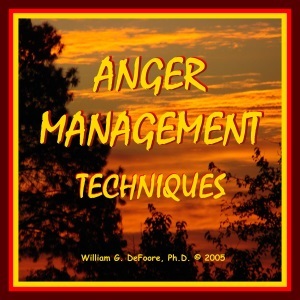 Don't Forget To Get Your Anger Management Audiobook!